The proposal to form a seafront garden came from Constance Maillard, Chairman of the Penarth Council for 1924-25. She was influenced by the ideas of Ursula Thompson, the first woman to graduate as a gardener from Kew Gardens, and those of Wilfrid Evans, who had made a rock garden at Llanishen, Cardiff. The eventual design was a collaboration between Wilfrid Evans and the Town Surveyor Edgar Evans. In November 1924 the Council agreed to borrow £2,000 to buy the land on the Esplanade and to lay it out as a pleasure ground. The purchase was completed in June 1925 and Esplanade Gardens, as it was then called, was opened on 31st March 1926 by Councillor C. P. Deverall, the Chairman of the Council. Other names in use at this time included Beach Rock Gardens, New Rock Garden and Promenade Garden. Council minutes generally used the name Esplanade Gardens or Rock Gardens. The name Italian Gardens was adopted later to reflect the italianate style. In May 1929 the Parks Committee placed an advertisement in Penarth newspapers inviting string bands to give concerts in the Rock Gardens. A number of performances were arranged that year and in September temporary lighting was provided for the use of the bands. The following year it was decided that a permanent lamp should be fixed in the Rock Gardens, and in September 1933 the Lighting Committee decided that this should remain lit until 9.30pm. By this time there was a shelter in the Rock Gardens: the Council decided in November 1933 lighting should be provided there. During the 1939-45 War the Council compiled a schedule of railings in the Town which were to be requisitioned for war purposes. Only railings of artistic or historic merit, or where there was an overriding security need, would be eligible for exemption. The Esplanade Gardens railings were removed in 1942 and in their place a chain link fence was erected in 1947. This can be seen in the postcard dated 1959. In 1946 as part of the victory celebrations it was decided that "Italian Gardens to be floodlit and dancing allowed until midnight." This was the first instance of the name Italian Gardens in Council Minutes. There was a temporary timber bandstand in the 1940s (and possibly earlier). It was reported to be in a dangerous condition in May 1949 and the Council decided that it should be dismantled. The Parks Committee agreed to a request from the Penarth Inner Wheel to construct a wishing well in February 1965. Four years later, the Rotary Club of Penarth suggested improvements to the area such that the hedge concealing the wishing well would be removed and an entrance and steps constructed in its place. This is now the southerly entrance to Italian Gardens. It was agreed that the Rotary Club would pay for floral gates together with the construction of steps to give access at the Wishing Well. It is worth noting that in the Committee Minutes the names Esplanade Gardens and Italian Gardens were both in regular use at this time. The present day Italian Gardens retains the layout of rock garden with flowers and shrubs, and is structurally little changed except for the absence of its original iron railings. The present iron railings were installed in 1994. 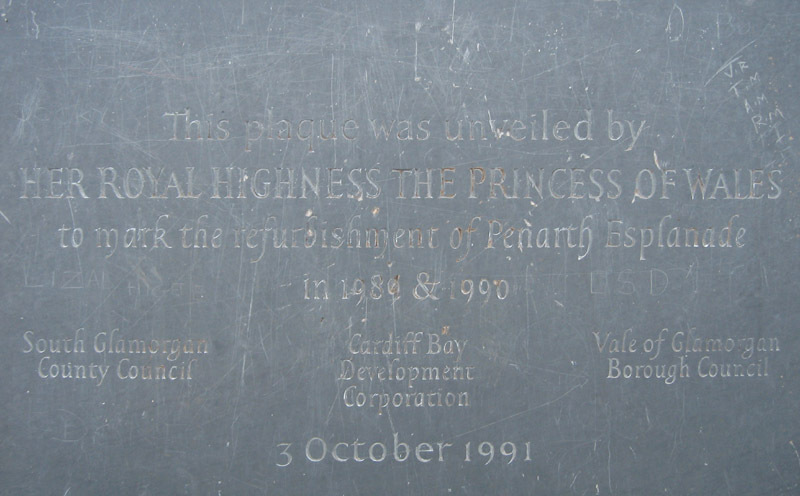 Within Italian Gardens is the plaque shown below, for which the Penarth Times published a photograph of the Princess of Wales performing the unveiling ceremony. Just inside the southerly entrance is a raised well with ornamental ironwork. The well is now filled with soil and flowering plants. 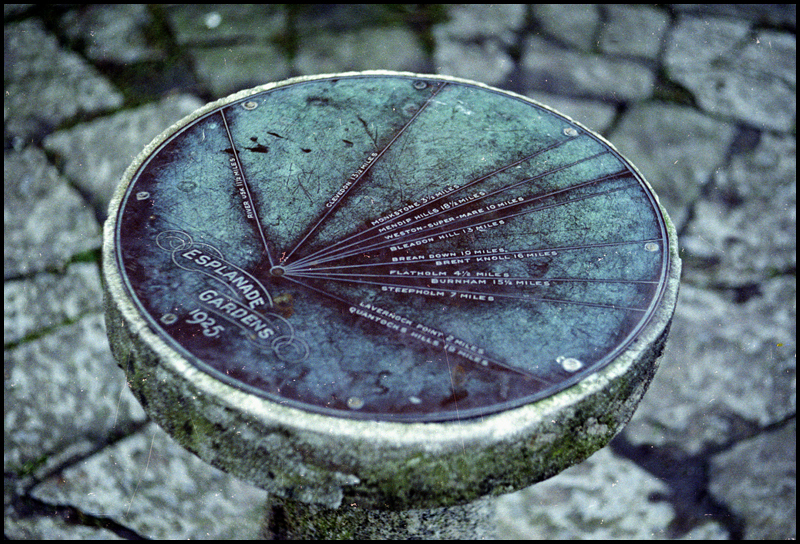 Nothing is currently known about the "view-pointer" photographed in Italian Gardens by Ben Salter. It is shown on a postcard, postmarked 1946. The pedestal base, with screw holes, can still be seen beside the centre steps of the garden. The "view-pointer" face itself is thought to have been stolen.